No visit to Maldon would be complete without visiting the Hythe Quay, home of the sailing barge, Maldon's living heritage. Many of the barges here have been lovingly restored by devoted owners and some are still in use commercially as charter vessels. The distinctive colour of the barge sails is due to a dressing of yellow ochre , cod oil (for waterproofing) and sea water. You can often see sails spread out on the quay for dressing with long handled brushes. Parking is limited in the immediate vacinity of the quay but there is a large car park in the ajacent Promenade Park or others off the High Street, just a few minutes walk away. There are two pubs on the Hythe: the Jolly Sailor and the Queens Head both offering food in their restaurants and bars. There are also numerous restaurants and take aways in the High Street. While Maldon sits proudly on a hill, the port is essentially at sea level. 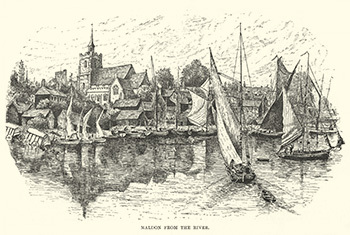 The Hythe, as the port is known, began life as a separate hamlet where the skyline is dominated by tower of St Mary’s Church. In the past, Thames Barges would leave the Hythe carrying foodstuffs and bedding straw to London returning with cargos of horse manure for the district farms. Fishing vessels left their moorings by the bath wall in search of eels, place, sole, whelks and winkles in the estuary. Some of the old fishermen’s homes still remain and can still be seen in a row facing the quay. At the north end of the Hythe was the boat building yard of John Howard whose house is still standing. Howard built more than twenty sailing barges and other craft during his working years. The other end of the Hythe was home to Cooks boatyard where among many others, the barge Dawn was originally built. Ships laden with timber and other materials would pass the Hythe destined for Sadd’s wharf just a little further along the river on the north side of Fulbridge wharf. Other vessels carried grain for the flour mills at Fullbridge. The Hythe is home to two public houses; The Queens Head sits on the quay while the Jolly Sailor is on slightly higher ground at the bottom of Church St.
St Mary’s Church, with it’s commanding view of the river, was founded during the Saxon period and rebuilt in the early 12th century. The tower was originally built around 1300 but the upper part collapsed in 1598. This caused a problem for the sailors as the tower was fitted with a beacon which was lit as a navigation aid for boats on the river. 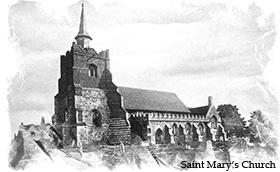 It was rebuilt with brick in 1635 and the spire was added in the mid 18th century.